by dave at Sept. 6, 2013, 4:43 p.m. The first Project Nightjar game was a big success, with 6 thousand players in the first few days - so we'll have lots of visual perception data to get through! Today I've been doing a bit more work on the egg generator for the next citizen science camouflage game. 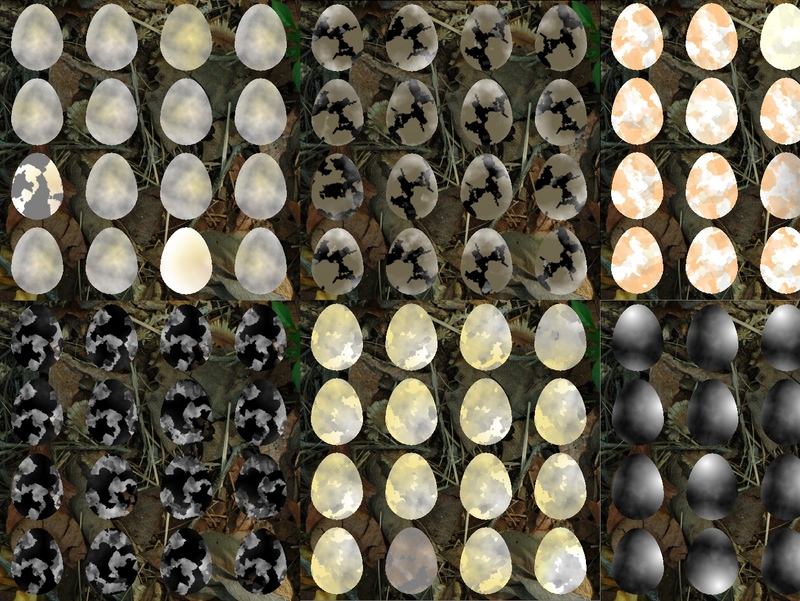 I've made 24 new, more naturalistic base images than the abstract ones I was testing with before, and implemented the start of the genetic programming system - each block of 4x4 eggs here are children of a single randomly created parent, each child is created with a 1% mutation rate. The programs trees themselves are 6 levels deep, so a maximum of 64 binary composite operations. All the genetic programming effort will happen in HTML5, thus neatly scaling the processing with the number of players, which is going to be important if this game proves as popular as the last - all the server has to do then is keep a record of the genotypes (the program trees) and their corresponding fitness.